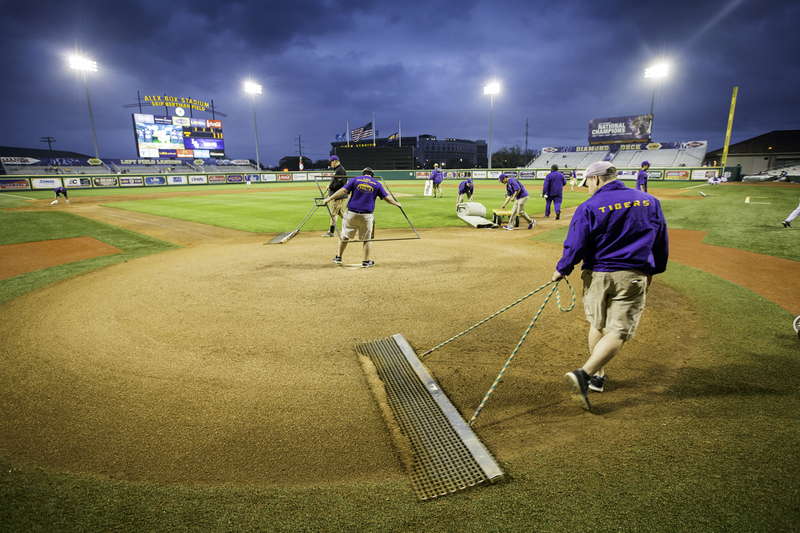 LSU student and grounds crew volunteer Jared Lusk, right, grooms around the catcher's box at Alex Box Stadium. For the first time ever, beer will be available at LSU baseball games in Alex Box Stadium, other than the Champions Club restaurant and bar, beginning Friday when the Tigers host Louisiana Monroe in the 7 p.m. season opener. New tented areas called “The Yard” will be opened at the left and right field corners of the stadium, LSU announced today. Both “Yard” tents will open two hours before first pitch. All beer and wine sales will stop at the end of the seventh inning. Fans cannot bring beers purchased in “The Yard” back to their seats because of Southeastern Conference policy, meaning all beer and wine must be consumed in the tented areas. Read the full announcement.